Something is toxic in the state of Denmark, as a pair of researchers recently discovered while archiving books at a university library. 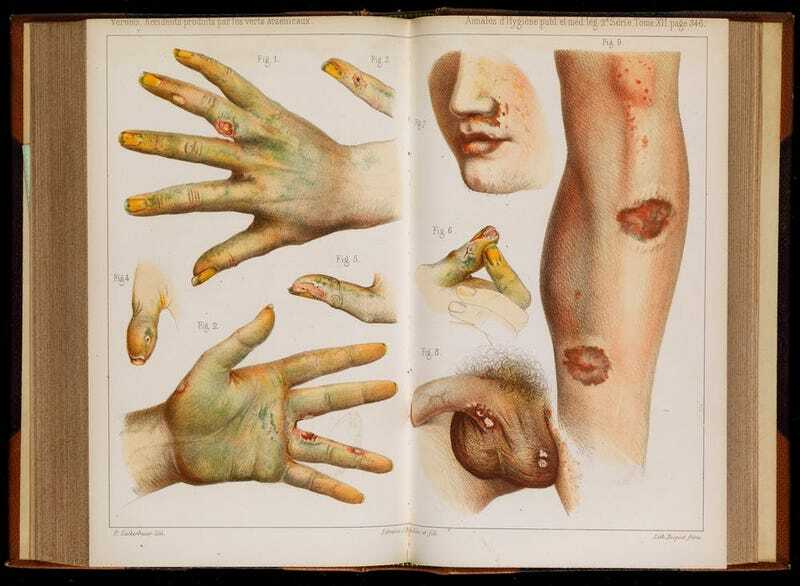 Analysing old books doesn’t sound like particularly dangerous work, unless those books happen to be covered in deadly arsenic, as researchers Jakob Povl Holck and Kaare Lund Rasmussen from the University of Southern Denmark recently found out. Writing in The Conversation, the two recount how they accidentally discovered three poisonous books in their university library, all of which date back to the 16th and 17th centuries. Holck and Rasmussen found the noxious books while trying to read old text hidden within the covers. Previously, library archivists had discovered that the covers of the three books had been manufactured from recycled materials, namely medieval manuscript fragments such as copies of Roman law and canonical law. In this well-documented recycling process, European bookbinders placed these fragments inside bindings to strengthen the base of the books. But for archivists, these manuscript fragments are hidden treasures waiting to be found. Holck and Rasmussen were trying to identify the Latin texts embedded within the bindings, but a thick layer of green paint made the content impossible to read. To pierce through the paint, the researchers used a scanning technique known as X-ray fluorescence analysis, or micro-XRF. This technique is used to investigate the chemical elements of ancient pottery and old paintings, and it works by using X-rays to reveal the chemical spectrum of a material. In this case, the researchers were hoping to use micro-XRF analysis to discern the chemical elements of the ink under the paint, and to see if they could make out individual letters. 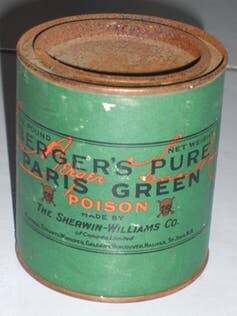 To their shock, however, they discovered that the green layer of pigment was made from arsenic. The arsenic pigment—a crystalline powder—is easy to manufacture and has been commonly used for multiple purposes, especially in the 19th century. The size of the powder grains influence on the colour toning, as seen in oil paints and lacquers. Larger grains produce a distinct darker green—smaller grains a lighter green. The pigment is especially known for its colour intensity and resistance to fading. Interestingly, the authors say the pigment wasn’t used for aesthetic purposes, as the paint was only used to cover parts of the books. A possible explanation is that the green paint was used to protect the books from insects and vermin. In terms of the risk posed to the University of Southern Denmark researchers, Holck told Gizmodo that “there was no real danger,” and that the books had been stored in a storage facility and were not easily accessible. For safekeeping, the books were placed in individual cardboard boxes (with warning labels), and they’re now stored inside a well ventilated cabinet. The next step will be to digitise the books to minimise the need for handling. Despite the poison, Holck said he was able to identify at least four Latin texts hidden within the bindings.